Chevrolet redesigns its biggest moneymaker for 2019, with a new understructure, fresh engines, less weight, beefier styling, and more safety and connectivity features. The all-new 2019 Silverado needs all these attributes as it faces tougher-than-ever competition from the recently revised Ford F-150 and fully redesigned 2019 Ram 1500. Larger in most every dimension, the ’19 Silverado returns regular-cab, extended Double Cab, and Crew Cab models with three bed lengths and six engine choices, including the first use of a four-cylinder engine in a full-size pickup. Chevy says the pickup is up to 450 pounds lighter than the 2014-2018 Silverado, contributing to higher payload and tow ratings. Highlights include an available power tailgate, V-8 engines that can run on just two cylinders to save gas, and addition of the off-road-optimized Trail Boss model with a factory 2-inch suspension lift. In the full-size-pickup sales race, Silverado finished second to the Ford’s F-Series for 2018, but its grip on that position is slipping. Demand fell 20 percent in December 2018, while the third-place Ram 1500 posted a 34 percent increase, beating the Chevy by more than 5,700 sales for the month. At that pace, Ram could overtake Chevrolet for second place in 2019, an unprecedented development. All is not bleak for General Motors, of course. Add in sales from Silverado’s underskin twin, the similarly redesigned GMC Sierra, and the two pickups handily outsell the Ram – although their combined numbers still trail the F-Series. Consider a 2019; the 2020 won’t likely change enough to be worth waiting for. It’ll probably get some new exterior colors, and maybe some options will be shuffled. A Silverado ZR2 is rumored to be in the works as a new flagship off-road rival for the likes of the Ford F-150 SVT Raptor or Toyota Tundra TRD Pro. It’s unclear, however, whether such a Silverado might debut for model-year 2020 or ‘21. Otherwise, the 2020 lineup should mirror that of the 2019. Trim levels would ascend through WT (Work Truck), Custom, Custom Trail Boss, LT, RST, LTZ, LT Trail Boss, and High Country. Returning would be the two-door Regular Cab, which has an 8-foot bed, along with an extended Double Cab that has a 6.6-foot bed and half-size rear doors that open independently of the fronts. Also back as the most popular option would be the Crew Cab with four full-size doors and available bed lengths of 5.8 and 6.6 feet. A V-6 and two V-8 engines were available at the truck’s launch. A turbocharged four-cylinder joined the ranks in the summer of 2018, and a turbodiesel inline 6-cylinder is slated to arrive in early-calendar 2019. 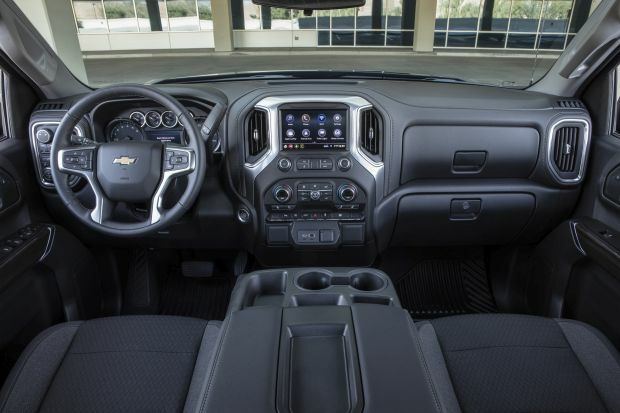 Styling: The redesign gives Silverado a more contemporary look that should age better than the previous generation’s. Styling ranges from appropriately workmanlike in the WT to country-club classy in the LTZ and High Country. The Trail Boss stands out for its extra ground clearance, blackout grille and wheels, and chunky off-road-ready tires. (We wish Chevy painted the front tow hooks a color other than red because that’s what Jeep uses for TrailHawk versions of its SUVs.) The RST has more body color trim, appropriate given its positioning as a street truck. More aggressive wheels and a lower stance, as on RST versions of Chevy’s Tahoe SUV, would have added to its character. Silverado’s cabin lacks some of the “gee-whiz” gadgetry of the revamped Ram 1500. For instance, it doesn’t offer a massive, ultra-high-resolution touchscreen for its audio, navigation, and climate controls. At the same time, this could very well be a virtue for many buyers because the Chevy presents a clean, simple instrument and control layout. Everything is where it should be and falls easily to hand, even when wearing heavy gloves. That’s not to say Silverado is behind the times. All models offer a 7- or 8-inch touchscreen infotainment with the brand’s updated “Chevrolet Infotainment 3” software interface that comes with support for Apple CarPlay and Google Android Auto. The system is very responsive and intuitive enough to where even the most technologically averse can get up and running quickly. Higher-end grades also include a USB Type-C port, which is a boon for modern smartphones. A column-mounted transmission shift lever seems a bit retrograde compared with Ford’s center-console stalk or Ram’s twist knob. But it allows you to order an extended center console with a massive amount of storage. A dual glovebox and wide door pockets complement it. There are also a couple small bays cleverly hidden within the rear seat cushions. Passenger room is another Silverado asset. The front seats afford plenty of legroom. Models equipped without the optional power sunroof have an indentation in the ceiling that creates extra headroom. The rear seats in Crew Cab models have 3 extra inches of legroom versus the previous-generation Silverado, and you can immediately tell the difference. Even the very tall will be able to stretch their legs. Trail Boss intenders will want to invest in a set of running boards because step-in is taller than in other Silverado models. The extra ride height also creates an issue when accessing the bed because the steps cut into the corners of the rear bumper are that much higher off the ground. 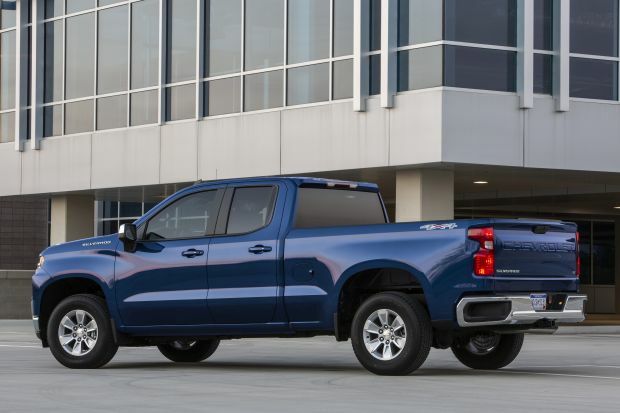 Overall, it’s less convenient than the built-in tailgate step you can get in a Ford F-150 or Silverado’s mechanically similar sibling, the GMC Sierra 1500. On the plus side, the Trail Boss’ interior can be easily hosed out if it gets dirty. 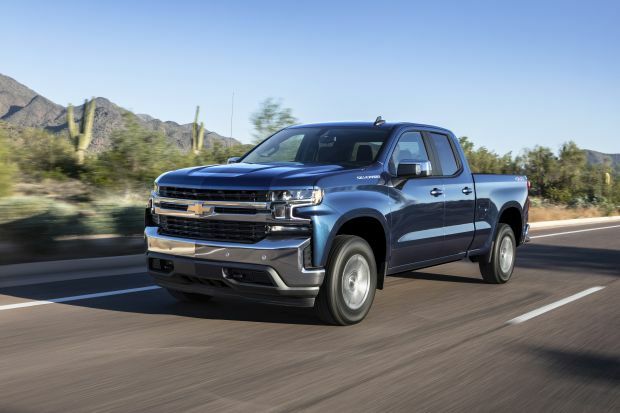 Mechanical: Overall, the 2019 Silverado is 1.6 inches longer overall and 3.9 inches longer in wheelbase (the distance between the front and rear axles) than its predecessor. Chevrolet claims that the revamped underskin structure is 10 percent more rigid than the outgoing truck while curb weights are down by up to 450 pounds. Silverado retains a steel body and floor, unlike the aluminum-intensive F-150. Rear-wheel drive is standard on the WT, Custom, LT, RST, LTZ, and High Country. Four-wheel drive (4WD) is available on these models and standard on the Trail Boss. Some grades use a part-time setup that cannot be left engaged on dry pavement. Others, including the Trail Boss, have full-time 4WD that can; they also have an all-wheel drive mode that can automatically apportion power in case of wheel slip. Some drivetrain options carry over from the previous-generation Silverado. Those include the entry-level 4.3-liter V-6 with 285 horsepower and 305 pound-feet of torque and one version of Chevrolet’s mainstream 5.3-liter V-8 with 355 horsepower and 383 pound-feet of torque. These engines pair with a 6-speed automatic transmission and include Active Fuel Management, which shuts down half the cylinders at cruising speeds to save fuel. Next up the ladder is a heavily updated 5.3-liter V-8. Horsepower and torque ratings are unchanged, but this engine teams with an 8-speed automatic transmission. It also employs GM’s new Dynamic Fuel Management. This is an advanced version of Active Fuel Management that allows the engine’s computer to optimize fuel consumption among 17 pre-programmed configurations, including the ability to run on as few as one cylinder. The rest of Silverado’s engine offerings include a 6.2-liter V-8 with 420 horsepower, 460 pound-feet of torque, a 10-speed automatic transmission, and Dynamic Fuel Management. New to the full-size pickup segment is a 2.7-liter turbocharged four-cylinder, which has 310 horsepower, 348 pound-feet of torque, an 8-speed automatic transmission, and Active Fuel Management. Full information about the upcoming turbodiesel engine was not available in time for this review. We know it will be a 3.0-liter inline 6-cylinder paired with a 10-speed automatic transmission and no fuel-saving measures other than idle stop/start. Projected output is 282 horsepower and 450 pound-feet of torque, which would beat the rival F-150’s available diesel V-6 by 32 horsepower and 10 pound-feet. Our 2019 Silverado test truck used the 5.3 V-8/8-speed combo. The engine was a paragon of refinement, even in the rough-and-tumble Trail Boss. Acceleration was smooth and strong at any speed, aided by the slick transmission. Dynamic Fuel Management behaved completely transparently, with no observable quirks, such as bogging or surging. It’s truly impressive technology that allows for more fuel-saving opportunities versus more traditional cylinder deactivation and engine idle stop/start. Silverado sticks with an independent front suspension and a traditional solid rear axle. The Trail Boss employs Chevy’s “Z71” off-road suspension with specially tuned shock absorbers, plus an additional 2 inches of ride height. Despite this heavy-duty kit, the on-road ride and handling are surprisingly compliant. Neither is as well controlled as in the similar-purpose Ram 1500 Rebel, but Silverado exhibits little more hop and tail skitter than in other large trucks with street tires and a standard suspension. The downside comes in terms of road noise where the Trail Boss’ blocky tires drone loudly on all pavement surfaces. We did not have an opportunity to take it off-road, but we’re confident its beefy hardware will have no trouble taking on difficult terrain, assuming the truck’s sheer size is not an obstacle itself. Features: As with other full-size trucks, you can equip a 2019 Silverado spartanly, lavishly, or somewhere in between. While full information on the Regular Cab body style was not available in time for this review, we can safely assume it will match its Double and Crew Cab counterparts for standard and optional equipment, depending on trim-level selection. Chevrolet did miss an opportunity to be a leader in offering advanced driver-assistance features in the redesigned Silverado. Important aids such as forward-collision alert, lane departure warning with automatic steering correction, and automatic high-beam headlights are only available as extra-cost options on the LTZ and High Country. The autonomous emergency braking system that’s also optional on the two flagship trims only works at low speeds. Adaptive radar cruise control is unavailable on any Silverado. Among trim levels, the contractor-spec WT has vinyl upholstery, steel wheels, and 12 convenient cargo tie-down points in the bed. Unlike some entry-level rigs, Silverado comes standard with power windows and locks, along with CarPlay and Android Auto. Most retail buyers should start their search at the Custom grade, which adds body-color exterior trim, aluminum wheels, LED taillights, cloth upholstery, and cruise control, among other amenities. LT grades remove the Custom’s LED taillights but add some chrome exterior pieces, full LED headlights, and the 2.7-liter four-cylinder engine. Trail Boss versions of the Custom and LT mirror their standard counterparts but add a trailer-tow package, elevated off-road suspension, and specific wheels and tires. RST adds keyless access with pushbutton ignition, full body-color exterior pieces and LED exterior lighting, and a power-release tailgate. LTZ also gets a trailering package, 5.3-liter V-8 with Dynamic Fuel Management, more chrome trim, leather upholstery, heated 10-way power front seats, driver-seat memory, heated steering wheel, dual-zone automatic climate control, remote engine start, and 8-inch touchscreen infotainment. The range-topping High Country adds tailgate with power up/down operation, imbedded GPS navigation, Bose-brand audio system, ventilated front seats, heated outboard rear seats, blind-spot alert with rear cross-traffic detection, and front- and rear-obstacle detection. Including Chevy’s $1,495 destination fee, 2019 Silverado base prices start at $29,795 for a rear-drive Regular Cab WT and rise to $58,095 for a 4WD Crew Cab High Country with the 6.6-foot bed. Optional equipment ranges from 4WD to more powerful engines to upgraded safety and convenience amenities. Prices vary depending on grade selection so we’ll hit only a few of highlights. The Z71 Off-Road Package ($350-$1,545) is available on most grades, including the WT. It offers uprated suspension, hill-descent control, protective underbody skid plates, locking rear differential, full-time 4WD, and specific exterior badging. At the opposite end of the spectrum is the $2,150 Performance Upgrade Package that includes high air flow intake and exhaust systems. The WT Convenience Package ($1,120) adds remote entry, power release tailgate, cruise control, and a rear-window defroster. The WT Safety Package ($1,090) includes obstacle detection, blind-spot alert, rear cross-traffic detection, and chrome bumpers. On Custom grades, including Trail Boss, the Value Package ($1,470) adds remote engine start, rear window defroster, LED cargo bed lighting, remote tailgate release, satellite radio, and OnStar telematics with built-in 4G LTE Wi-Fi hotspot. The Convenience Package for the LT ($2,025) and LT Trail Boss ($1,210-$1,805) contains dual-zone automatic climate control, 10-way power driver’s seat, heated front seats and steering wheel, and tilt and telescopic steering column. LT versions also add keyless access and starting, remote engine start, remote tailgate release, and LED bed lights. Ordering this package opens access to the Convenience Package II ($1,145 on the LT, $1,420 on the LT Trail Boss), which includes a power-sliding rear window, extra 120-volt power outlets in the cab and bed, 8-inch touchscreen infotainment, and a high-definition rearview camera. The All-Star Edition package includes everything in the base Convenience Package plus a locking rear differential and heavy-duty trailering equipment. It costs $2,815 on the LT and $2,075 on the RST. All-Star-equipped LT models are sold as the Texas Edition in Arkansas, Louisiana, New Mexico, Oklahoma, and Texas. LTZ grades offer their own Convenience Package for $1,550 that includes upgraded front bucket seats with heating and ventilation, power sliding rear window, extra USB power points, power up and down tailgate, and heated outboard rear seats on Crew Cab body styles. The LTZ Convenience Package II is $1,070 and includes imbedded GPS navigation, Bose-brand audio, and wireless smartphone charging. The $1,875 Technology Package adds a high-definition surround-view camera and head-up instrument display. An $890 Safety Package includes front- and rear-obstacle detection, blind-spot alert, and rear cross-traffic detection while the $745 Safety Package II adds forward-collision warning, lane-departure alert with automatic steering correction, low-speed automatic emergency braking, and auto high beams. The LTZ Premium Package lists for $6,350 and includes all the contents of the two Convenience and Safety Packages plus a power sunroof and polished aluminum wheels. High Country models offer similar Safety II and Technology packages as the LTZ, with prices of $745 and $1,625, respectively. The $3,940 High Country Deluxe Package includes Safety Package II, sunroof, and polished wheels. If we had to narrow the Silverado lineup down to a single best value pick, we would go with a 4WD RST Crew Cab short bed with 5.3-liter V-8, All-Star, Safety, Max Trailering, and Bed Protection packages. This would put the sticker price at $53,860. Our well-optioned LT Trail Boss review sample presented an interesting value case for off-road adventure seekers. Its as-tested price of $56,790 was not far off from that of a similarly equipped Jeep Wrangler Unlimited Rubicon. Granted, Silverado doesn’t have the Jeep’s cachet or projected resale value, but the pickup boasts more power, passenger room, and greater overall refinement. You could also probably get the Trail Boss with a much steeper discount, so it could very well cost you less. EPA-estimated fuel-economy ratings for the diesel engine were not available in time for this review. Gas-powered Silverado models are class-competitive, with some V-8 models beating turbocharged V-6 versions of the F-150. Avoid the 4.3-liter V-6 if you can. Its fuel-economy ratings are a rather dismal 16/21/17 mpg city/highway/combined with rear-wheel drive, 15/20/17 with 4WD, and 14/18/16 on the Custom Trail Boss. Ratings vary on other Silverado models due to trim level and wheel/tire size. We’ll include ranges where applicable. With the 5.3-liter V-8 and 6-speed automatic transmission, rear-drive models rate 15/20-21/17 mpg. Those with 4WD rate 15/19-20/16-17 mpg. Moving to the 5.3 V-8 with the 8-speed and Dynamic Fuel Management improves the ratings of most models to 17/23-24/19 mpg with rear drive and 16/22/18 with 4WD. The Trail Boss’ ratings don’t improve over its V-6 counterpart, so there’s no reason not to get the V-8. Even the high-output 6.2-liter V-8 does well, with ratings of 16/20/17 mpg. Note that this engine is only offered on 4WD models. The 2.7-liter four-cylinder sees ratings of 19-20/22-23/20-21 mpg with rear drive and 18-19/21-22/19/20 with 4WD. GM recommends, but does not require, premium-grade 91-octane gasoline for the 6.2-liter V-8. All other gas engines use regular-grade 87-octane. Probably not much. It’s possible future Silverado models might be available with some features that are currently exclusive to its corporate cousin, the GMC Sierra 1500. One is its optional carbon fiber bed, which is made from a composite material that’s 62 pounds lighter than steel while bring more resilient to dents, scratches, and corrosion. It would negate the need for any sort of factory-installed or aftermarket bed liner. The other is the Sierra’s “MultiPro” tailgate that incorporates a load stop, foldable inner gate, and full-width step. This feature would fully address our criticism of the Silverado’s bed being more awkward to access than in some rivals.